By Hazel Chua on 08/06/12 • Leave a comment! Relatively simple or easy tasks usually take longer to do on a laptop without a mouse. I’m not a huge fan of touchpads, although I do find them useful on the occasion that I forget to bring my USB mouse with me. And when you’ve got a desktop with a busted mouse? Just forget about it. Unfortunately, what seems like a godsend invention can also be your wrist’s downfall. Because clicking involves pushing your finger down on the clicker again and again and again, the muscles in your forearm and wrist will eventually rebel and a nerve might get stuck somewhere in between. Thus will begin your battle against carpal tunnel syndrome. The solution? The Up Mouse. Instead of clicking down, this mouse will have you clicking up. This way, you’ll be using a whole different set of muscles that don’t go through the carpal tunnel at all. It might feel weird at first and will definitely take some time to get used to, but your wrist will thank you for it. 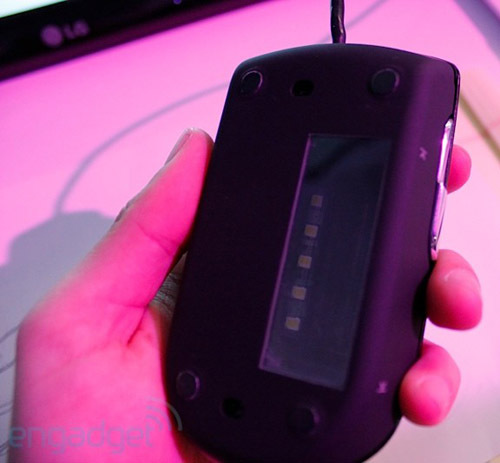 Check out a video of the Up Mouse prototype and a link on how you can get it after the jump. 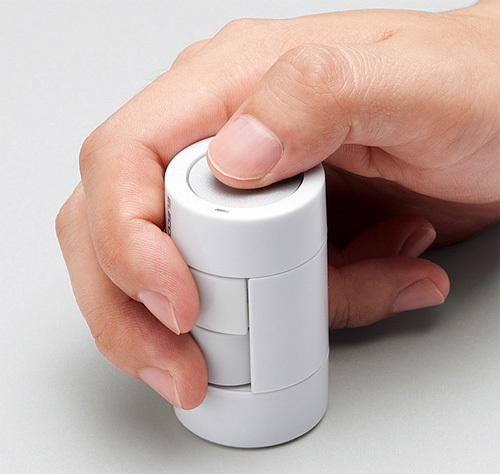 Elecom continues their partnership with Japanese design studio nendo, this time bringing the world a compact wireless mouse that looks like it was made from a discarded D-cell battery. The unique design certainly makes it compact and easy to travel with, but at first glance the ergonomics look like they’d take a little while to get used to. (Given most of us are used to mousing with our hands laid flat.) The Kandenchi has 3 buttons in total, with the bottom one on the side doubling as a scroll wheel. 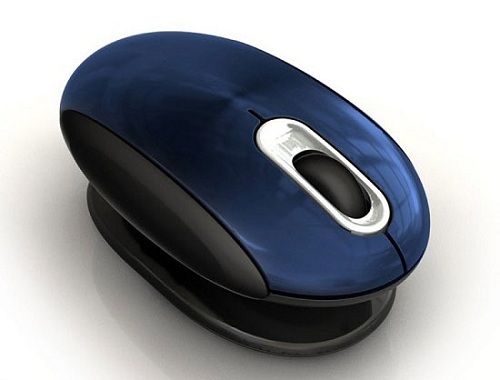 And an included tiny wireless USB receiver can be stashed inside the mouse when not in use. “Shipping Soon” with a TBD price point. By Andrew Liszewski on 06/22/11 • Leave a comment! Cordless mice certainly have their advantages when it comes to keeping your desk free of tangled cables, but they also require batteries and tend to be a bit heavier than their tethered brethren. 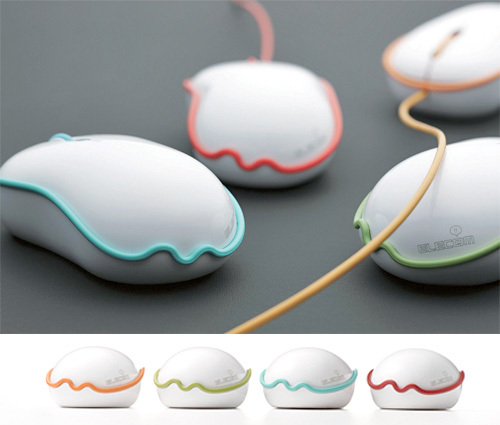 So to show that corded mice are still very much alive, well and occasionally even appreciated, Elecom has once again teamed up with Japanese design studio nendo. If you recall, their last collaboration resulted in the jellyfish-inspired Otokurage earbuds, and this time around it’s the Rinkak mouse which not only still uses a USB cable, but is damned proud of it. So much so that the cord actually appears to be integrated into the mouse’s design. In Japanese, ‘Rinkak’ is a term that “refers to an object’s outline against its background” (silhouette?) so in this case it’s the colored cable that encircles and stands out against the mouse’s white facade. The mice will be available in Japan at the end of June for a yet to be specified price, and internationally sometime after that. Building a better mouse trap may be a phrase nearly lost to time, but building a better mouse has never been more timely. Spending 8 to 12 hours per day at a computer, you really start to develop an appreciation for the tiniest changes in your controls. Logitech, who has made a name for itself subtly tweaking and perfecting the mouse, has made more radical changes in its line of trackballs. Their latest, the M570 Trackball, has moved the almost comfortably placed trackball out from under our fingers. The bright blue, gumball-sized sphere is now exclusively controlled by your thumb. With the ball out of the way, the rest of the M570 looks like a perfectly comfortable mouse with four conveniently placed buttons and a scroll wheel. Ergonomics aside, the trackball is exclusively made for right handed users and there’s inherently a steep learning curve, especially for first time users. Additionally, the trackball also comes with Unifying receiver so you can easily share the wireless USB dongle with other compliant input devices. Although much better for your wrists, how hard will it be to switch to using your thumbs to ‘mouse’ around? Does the more natural feel of the rest of trackball make up for having to retrain your clumsy thumb? You can decide for yourself after checking out the review at Everything USB. Announcing The Winners Of The Smartfish Whirl Mini Mice! The three winners are Ivan Gustavo Flores Molina, Billy Kent, and lizmoney. Each of you will be receiving a Smartfish Whirl Mini mouse! Congratulations to these three, and for those that didn’t win, we’ll be announcing a new contest happening over at GamerFront.net a little later in the day, so stay tuned! When I stop and think about it, between laptop touchpads, touchscreen phones and tablets and my Wacom tablet, I very rarely use a mouse these days. 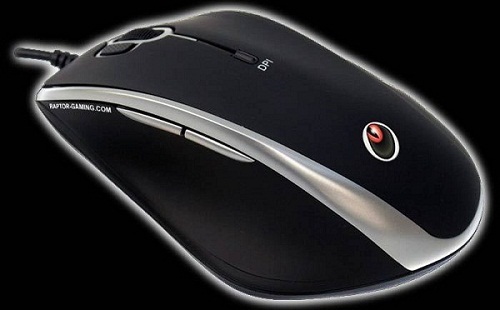 And if a company called Celluon has anything to say about it, the mouse as we know it may soon be extinct. 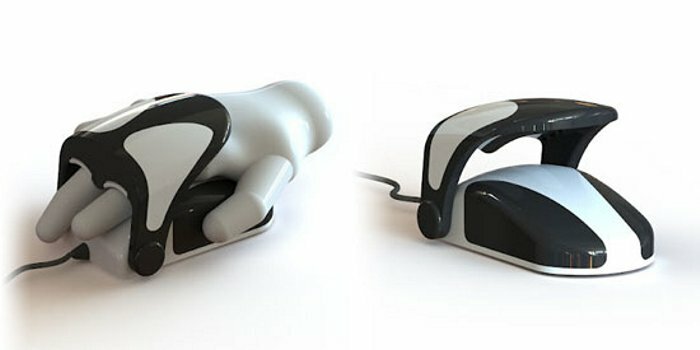 Using similar technology to those projected laser keyboards, the evoMouse sits on your desk just above where you’d normally be pushing a mouse around, and instead tracks the movements of your fingers. Those movements are then translated into cursor movements on screen, allowing you to use just your fingers for everything from scrolling to dragging files to even accessing context menus. The evoMouse itself is barely larger than an actual mouse, seemingly making it ideal for traveling, and you can connect it to your computer via USB or via Bluetooth if you’d prefer to keep things wireless. It’s even compatible with styluses if you’d like to use it as a portable drawing tablet, or want to take advantage of the evoMouse’s handwriting recognition technology. Pricing and availability are still TBA. Your mouse; It points, it clicks. Don’t you sometimes wish that it could do so much more than that? What if it could scan documents? That could be useful, right? I’m sure there’s someone out there that gets excited at the prospect of waving their mouse over a sheet of paper in order to reproduce it digitally on their computer. I could see this being useful for oversized documents that won’t fit on a normal scanner, but that’s really about it. Honestly, with a resolution of only 300dpi, I can’t say I’d be all that excited to use it. Maybe if they could increase that to at least 600 by the time they bring this thing to market, LG might be able to sell a few units.